Not to be confused with C. J. Spillman. Lake Butler (FL) Union Co.
Clifford "C. J." Spiller Jr. (born August 5, 1987) is an American football running back who is a free agent. He played college football for Clemson and was recognized as a unanimous All-American. He was drafted by the Buffalo Bills with the ninth overall pick in the 2010 NFL Draft. He has also played for the New Orleans Saints, Seattle Seahawks, New York Jets and Kansas City Chiefs. Spiller was born in Lake Butler, Florida. He attended Union County High School (Florida) in Lake Butler, where he excelled at track, as well as football. At Union County High School, Spiller played along fellow Clemson teammate, Kevin Alexander. During his senior year at Union County, he rushed for 1,840–yards on 176 carries for 30 touchdowns. He also had fifteen receptions for 249 yards. In his high school career, Spiller rushed for 5,511 yards on 541 carries. Spiller received an athletic scholarship to attend Clemson University, where he played for the Clemson Tigers football team from 2006 to 2009. As a true freshman, Spiller immediately made himself known to the Clemson fans. In the season, he rushed for 938 yards and ten touchdowns on 129 rushes, despite being the second-team running back behind James Davis. He scored his first collegiate touchdown in a 34–33 overtime loss to Boston College on an 82–yard touchdown reception from quarterback Will Proctor. After struggling versus Florida State the following week, Spiller turned it around against North Carolina by rushing for fifty-eight yards and two touchdowns in a 52–7 rout of the Tarheels. In the following weeks, Spiller had two triple-digit rushing games as the Tigers defeated Louisiana Tech and Wake Forest. Against Louisiana Tech, he rushed for 127–yards and two touchdowns on eleven attempts, in a 51–0 rout of the Bulldogs, in which the entire Clemson team rushed for 393 yards. In a Gameday-featured game vs. 13th ranked Georgia Tech, Spiller rushed for 116 yards, including a 50-yard touchdown run, as well as catching a 50-yard swing pass touchdown en route to the Tigers 31-7 win. Clemson finished the season with an 8–5 overall record, losing four of their final five games, including a 31-28 loss to archrival South Carolina, and ended the season in a 28–20 Music City Bowl loss to the Kentucky Wildcats. Spiller rushed for only twenty-four yards on five attempts in the loss. In his second season for the Tigers, Spiller had a less productive rushing season with only 768 yards and three touchdowns. He did, however, gain more receiving yards, with 271–yards and two additional touchdowns. In the opening three games of the season, Spiller rushed for only eighty-five yards, including a career-worst –1–yards in a 38–10 victory over Furman. In a 13–3 loss, he was again stopped by the Georgia Tech defense, rushing for only two yards. His best statistical game came against rivals South Carolina, which Clemson won 23–21. Spiller ran for a team-high 122 yards on twenty-three attempts in the victory. In the team's bowl game, he rushed for 112–yards on eight attempts, including one touchdown, in a 23–20 loss to Auburn in the Chick-fil-A Bowl. With Spiller and fellow running back James Davis, the Clemson Tigers were favored to win the opening game of their 2008 season against the Alabama Crimson Tide in the Chick-fil-A College Kickoff. However, a stingy Alabama defense held Spiller to just seven yards on two attempts. He did score though, on a kickoff return for a touchdown. In his second game, however, he rushed for seventy-five yards on six carries, which included three touchdowns in a 45–17 victory over The Citadel. Against Virginia later that year, Spiller threw his first career touchdown on a trick play. On January 15, 2009, he announced that he would remain for his senior year at Clemson instead of entering the 2009 NFL Draft. In the Tigers' 40–24 victory over the Florida State Seminoles on November 7, 2009, Spiller and Jacoby Ford became the leading all-purpose duo in NCAA history (a record previously held by Marshall Faulk and Darnay Scott of San Diego State). On November 28, 2009, Spiller set the FBS record for kickoff return touchdowns with seven during his career. He also earned his spot in the record books in another way on that kickoff return, by being one of five players to ever gain 7,000 all-purpose yards. Spiller was one of the three finalists for the 2009 Doak Walker Award, and placed sixth in the voting for the Heisman Trophy. Spiller was selected for the All-Atlantic Coast Conference (ACC) first team, and was voted the ACC Player of the Year by the members of the Atlantic Coast Sports Media Association. He was also recognized as a unanimous first-team All-American. He was the nation's only player that season to account for touchdowns five different ways—rushing, passing, receiving, and on kick and punt returns—and had passing, rushing and receiving touchdowns in one game, a victory against North Carolina State, a first for a player in Clemson history. He returned four kickoffs and a punt for scores that year and had eight total returns for touchdowns during his career. He scored at least once in every game that season while leading Clemson to the Atlantic Division title and a spot in the league title game against Georgia Tech. Spiller led the ACC with an average of nearly 184 all-purpose yards and was the league's fourth-leading rusher, averaging 76 yards. Spiller graduated from Clemson in December 2009, becoming the first person in his family to receive a four-year college degree. Also, Clemson retired his No. 28 in recognition of his college career. Spiller was the only player in the FBS to score a touchdown in every game in the 2009 season. 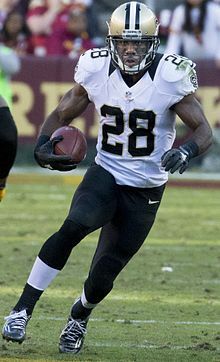 Despite being projected as a first-round pick in the 2009 NFL Draft, Spiller decided to return for his senior season in January 2009. He was projected as a first-round draft choice in the 2010 NFL Draft and was listed as the No. 1 running back of the 2010 class by ESPN. Spiller was selected 9th overall in the 2010 NFL Draft by the Buffalo Bills. He was the highest drafted Clemson player since Banks McFadden (1940 NFL Draft) and Gaines Adams (2007 NFL Draft), both of whom went fourth overall. On August 6, 2010 Spiller signed a five-year $25 million deal ($20.8M guaranteed). On August 19, 2010, Spiller rushed 31 yards for his first NFL touchdown in week two of the preseason at the Rogers Centre in Toronto, Ontario, Canada against the Indianapolis Colts. Spiller finished the 2010 preseason with 26 carries for 122 yards (4.69 average per carry) and three touchdowns. He also caught three passes for 35 yards. Spiller was named the #1 running back on Buffalo's final depth chart, ahead of the recently injured Marshawn Lynch and Fred Jackson. Lynch was later traded to the Seattle Seahawks. On September 12, 2010, Spiller played in his first career NFL game in a home loss against the Miami Dolphins. Spiller was named Special Teams player of the week for September 26, 2010 for a 95-yard touchdown return against the New England Patriots. Spiller also had a touchdown off a pass by Ryan Fitzpatrick. However, his rookie season was marked with disappointment as he scored no rushing touchdowns and accumulated fewer yards than running backs taken after him in the draft, including Ryan Mathews, Jahvid Best, and Toby Gerhart. For his rookie year in 2010, Spiller produced 283 rushing yards, 157 receiving yards, and 1189 return yards on 56 kickoff and punt return opportunities in 14 games (1 start). In 2011, it was announced that Spiller would trade numbers with Leodis McKelvin, receiving the number 28 in exchange for the number 21. Spiller wore number 28 at Clemson. Heading into Week 12, Spiller hadn't gotten as much action as the Bills were planning on because of the Pro Bowl caliber season that Fred Jackson was having, but Jackson was then placed on injured reserve, meaning Spiller would finally get his opportunity and become the Bills' starting running back for the rest of the season. In a Week 16 home game against the Denver Broncos on December 24, 2011, Spiller had the first 100-yard rushing game of his NFL career, rushing 16 times for 111 yards and a touchdown in a 40-14 win for the Bills. Spiller finished the year with 561 yards on 107 carries, with 4 rushing touchdowns and a 5.2 yards/carry average. He also recorded 39 receptions for 269 yards and 2 touchdowns. With Fred Jackson once again missing time due to injuries, Spiller took advantage of the opportunity to have a career year. In Week 15 against the Seattle Seahawks, Spiller reached the 1,000 yards rushing mark for the first time in his NFL career. He also only needed 154 carries to reach the mark - the fewest carries to 1,000 yards since Chicago Bears running back Beattie Feathers in 1934. Spiller rushed for 1,244 yards on only 207 carries and scored 6 touchdowns; his (6.009) yards per carry average (YPC) was second to Adrian Peterson's (6.025). He also caught 43 passes for 459 yards with two receiving touchdowns. Spiller was also elected to be in the Pro Bowl as an alternate for Baltimore Ravens running back Ray Rice, who participated in the Super Bowl. On August 27, 2013, Spiller took temporary leave from active status with the Bills to be with his family after the murder–suicide by his step-grandfather Hubert Allen, Jr. In 2013, Spiller rushed for 933 yards with 185 receiving yards in 15 games (10 starts). In Week 2 against the Miami Dolphins, Spiller returned a kickoff for a touchdown going 102 yards. For his efforts beyond that, Spiller was named the AFC Special Teams Player of the Week. On October 19, Spiller broke his collarbone against the Minnesota Vikings. He was placed on injured reserve/designated to return on October 21, 2014. He returned to action against the Raiders in Week 15. The 2014 season was a tumultuous year for the Bills' running backs, aside from Spiller's injury. Fellow running back Fred Jackson was also injured, leaving newly signed backs Anthony Dixon and Bryce Brown as the only healthy running backs for much of the season. On March 13, 2015, Spiller signed a four-year, $18 million contract with the New Orleans Saints. The deal included $9 million guaranteed. In a Week 4 game against the Dallas Cowboys, Spiller caught an 80-yard touchdown pass in overtime to win. It was Saints quarterback Drew Brees' 400th career touchdown pass. In Week 8 against the New York Giants, Spiller caught Brees' seventh touchdown pass of the game. Spiller was a healthy scratch for their season opener in 2016 against the Oakland Raiders because fellow running backs Travaris Cadet and Daniel Lasco were playing bigger roles, according to coach Sean Payton. On September 13, 2016, Spiller was released. On September 28, 2016, Spiller was signed by the Seattle Seahawks. He was released by the Seahawks on October 26, 2016. On November 2, 2016, Spiller signed with the New York Jets. He was released by the team on December 6, 2016. On February 24, 2017, Spiller signed a one-year $980,000 contract with the Kansas City Chiefs. Throughout the 2017 season, Spiller was subject to multiple transactions causing him to be cut and signed multiple times, most recently being signed for the fifth time on January 2, 2018, the Chiefs ninth transaction in less than a year involving Spiller. ^ "Kevin Alexander". Clemson Tigers. Archived from the original on September 3, 2008. Retrieved September 24, 2008. ^ "2006 U.S. Army All-American Bowl Roster". Rivals.com. Retrieved September 24, 2008. ^ "Rivals.com prospect rankings". Rivals.com. April 22, 2006. Retrieved September 24, 2008. ^ O'Shea, Michael. "Meet Parade's All-America high school football team". PARADE. Archived from the original on January 16, 2009. Retrieved September 24, 2008. ^ "Player Bio: C.J. Spiller". Clemson Tigers. Archived from the original on February 7, 2009. Retrieved September 24, 2008. ^ a b "C.J. Spiller stats". ESPN. Retrieved September 24, 2008. ^ "BC blocks extra point, knocks off Clemson in 2nd OT". ESPN. September 6, 2006. Retrieved September 24, 2008. ^ "Clemson tallies 7 rush TDs, over 300 rush yards in rout". ESPN. September 23, 2006. Retrieved September 24, 2008. ^ "With three 100-yard rushers, Clemson outclasses La. Tech". ESPN. September 30, 2006. Retrieved September 24, 2008. ^ "Georgia Tech vs. Clemson - Game Recap - October 21, 2006 - ESPN". ESPN.com. ^ "Woodson fuels Kentucky to first bowl in 22 years". ESPN. December 29, 2006. Retrieved September 24, 2008. ^ "Harper continues hot start as Clemson slams Furman". ESPN. September 15, 2007. Retrieved September 24, 2008. ^ "No. 13 Tigers miss four field goals, have punt blocked in loss". ESPN. September 29, 2007. Retrieved September 24, 2008. ^ "No. 22 Clemson hands South Carolina 5th straight loss". ESPN. November 24, 2007. Retrieved September 24, 2008. ^ "Auburn uses new spread offense, defeats Clemson for bowl win". ESPN. December 31, 2007. Retrieved September 24, 2008. ^ "No. 24 Alabama limits No. 9 Clemson's ground game in upset victory". ESPN. August 30, 2008. Retrieved September 24, 2008. ^ "Clemson rebounds with easy victory over Citadel". ESPN. September 6, 2008. Retrieved September 24, 2008. ^ "Clemson vs. Virginia - Game Recap - November 22, 2008 - ESPN". ESPN.com. ^ "Clemson vs. NC State - Game Recap - November 14, 2009 - ESPN". ESPN.com. ^ "C.J. Spiller Named 2009 ACC Player of the Year". Atlantic Coast Conference. December 2, 2009. Retrieved December 2, 2009. ^ "C.J. 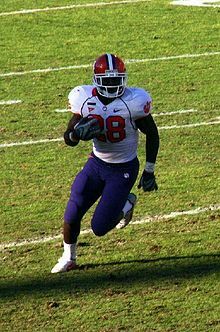 Spiller Named 2009 ACC Player of the Year". theacc.com. December 2, 2009. Retrieved September 7, 2011. ^ "Clemson retires C.J. Spiller's No. 28". ESPN.com. October 16, 2010. Retrieved September 7, 2011. ^ "C.J. Spiller Stats". ESPN.com. Retrieved September 7, 2011. ^ "NFL Events: Combine Player Profiles - C.J. Spiller". NFL.com. Retrieved September 22, 2016. ^ "C.J. Spiller - Clemson, RB : 2010 NFL Draft Scout Player Profile". NFLDraftScout.com. Retrieved September 22, 2016. ^ "Clemson Tigers sports news, scores, schedules, photos, videos ' Orange and White - Independent Mail". Independent Mail. ^ Richardson, Anwar (August 27, 2013). "C.J. Spiller leaves Buffalo Bills to be with family after tragic incident". Yahoo! Sports. Retrieved August 27, 2013. ^ Rodak, Mike (October 19, 2014). "Fred Jackson, C.J. Spiller injured". ESPN.com. Retrieved October 19, 2014. ^ Patra, Kevin. "Bills place C.J. Spiller on IR-recall, sign Phillip Tanner". NFL.com. Retrieved October 22, 2014. ^ Maiorana, Sal. "Grading the Bills: A record-low year for the running backs". DemocratandChronicle.com. Retrieved January 31, 2014. ^ Wilkening, Mike. "C.J. Spiller agrees with Saints". Pro Football Talk. Retrieved March 13, 2015. ^ "Saints-Cowboys recap". NOLA.com. October 4, 2015. Retrieved April 19, 2016. ^ Teope, Herbie (September 12, 2016). "New Orleans Saints RB C.J. Spiller inactive because of numbers game, coach Sean Payton says". NOLA.com. Retrieved September 18, 2017. ^ "New Orleans Saints release RB C.J. Spiller". NewOrleansSaints.com. September 14, 2016. ^ Boyle, John (September 28, 2016). "Seahawks Sign Running Back C.J. Spiller". Seahawks.com. ^ Patra, Kevin (October 26, 2016). "Seahawks cut veteran running back C.J. Spiller". NFL.com. Retrieved October 26, 2016. ^ Lange, Randy (November 2, 2016). "Jets Sign RB C.J. Spiller". NewYorkJets.com. ^ Allen, Eric (December 6, 2016). "Jets Waive C.J. Spiller and Jeremy Ross". NewYorkJets.com. ^ Patra, Kevin (February 24, 2017). "Kansas City Chiefs sign running back C.J. Spiller". NFL.com. ^ Paylor, Terez A. (January 2, 2018). "Chiefs bring back C.J. Spiller for the fifth time this season". KansasCity.com. Wikimedia Commons has media related to C. J. Spiller.